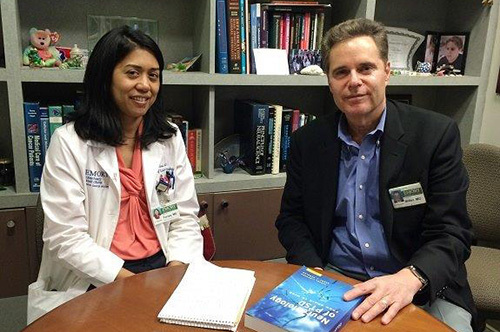 Mylin Torres, MD, director of the Glenn Family Breast Center, and longtime mentor Andrew Miller, MD, co-leader of Cancer Prevention and Control Program. Winship Cancer Institute of Emory University celebrates International Mentoring Day today in recognition of the critical role that mentorship plays in faculty development. Winship's mentorship program currently is being restructured under the leadership of Deborah Watkins Bruner, RN, PhD, associate director of Mentorship, Education and Training. "Winship members have extraordinary expertise and knowledge to share with junior faculty," says Bruner. "We want to make sure that anyone who wants a mentoring relationship has the resources and wherewithal to do that." The Winship Mentorship Committee spent its first year benchmarking Winship members by program, rank, and track and by conducting a Faculty Career Development Needs Survey. The survey, which had a 50 percent response rate (111 out of 221), asked assistant and associate professors who are Winship members to identify their priorities for mentorship and gaps where they feel more mentorship is needed. The top priorities include developing a promotion dossier, grantsmanship, guidance on producing publications, management and execution of research, and participation in or management of team science. The gaps identified by respondents include incorporating technology in the classroom, managing difficult situations, teaching in an inter-professional simulation or class, maximizing the impact of scholarship, and test writing. The Winship Mentorship Committee and the Winship Membership Committee were recently combined to form the Winship Faculty and Trainee Development Committee, co-chaired by Bruner and Kimberly Kerstann, PhD, senior director for Research Administration. This committee will review new member applications, assign new members to appropriate programs, and recommend mentors as needed. Winship research programs are enhancing mentorship by instituting measures to ensure that assistant members have assigned mentors and by incorporating mentorship events in their programming at least once per semester. Other activities include listing mentorship events and opportunities in the weekly Winship Roundup newsletter; mentorship-specific lectures via the Elkin Lectures or Grand Rounds at least once per semester; and development of a nominations subcommittee, chaired by Carla Berg, PhD, associate director of population sciences, to nominate Winship members for appropriate internal and national awards, committees, and appointments. A Women in Winship subcommittee also has been started, co-chaired by Kristin Higgins, MD, medical director of the Department of Radiation Oncology on the Clifton campus, and Catherine Williams, associate director of communications, to develop mentorship specific to the needs of women in cancer and academia.